We've got a ten year old in the house. It's a bizarre feeling, having been a parent for a decade. I mean, I can't possibly be old enough to have given birth ten years ago, right? That's just crazy. But enough about me. I handed this plate to Nat to take the photo, and he sat there transfixed. 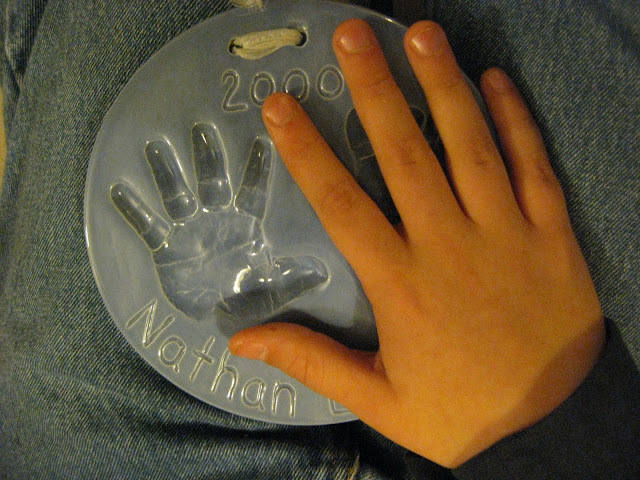 I didn't even have to tell him to put his hand next to the imprint of his two week old hand, he did it himself, with awe. Nathan's hands are almost as big as mine. His feet are the same size. He wants to wear my Doc Martens. I'm not willing to share $100+ footwear with the boy who likes to scuff his shoes for fun. And he's half an inch shy of 5' tall. Wow. Ah yes, cinema gold! Good thing the Flip camera is a sturdy thing with no moving parts! Also, for his birthday, we got tickets for Michael and Nathan to go see a Kings game at the Staples Center. We are not an athletic family. We don't play sports, or even watch sports. But Nathan has somehow become a fan of ice hockey. So tickets for Nat and his Dad to go see a game together ended up being a great gift, even if the Kings lost. During the month of November we happened to be in Anaheim near the place that we lived while I was pregnant and where we brought him home from the hospital after he was born. We drove around until we found it, and then took a photo of him. It was a little two bedroom + loft townhouse, and not much to look at, but it is the place where we went from being husband and wife to being a family. Nathan only lived there for ten weeks, and then we all jumped on a plane and moved to Japan. But he said he was pretty sure he remembered living here. Funny kid. Happy Birthday, Nathan! You are the light of my life and the spice in my spice cake. Life would be dull without you. Quite dull indeed.